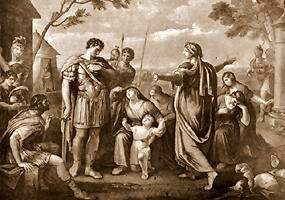 CORIOLANUS, AUFIDIUS, VIRGILIA, VOLUMNIA, YOUNG MARCIUS, VALERIA, AND ATTENDANTS. Down, ladies! let us shame him with our knees. Than thou hast to deny't.Come, let us go. Painted by Gavin Hamilton. Engraved by James Caldwall.